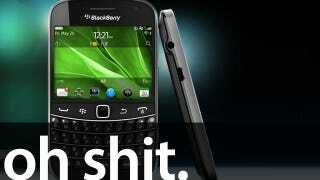 RIM, the maker of BlackBerry, was absolutely destroyed yesterday in the stock market. But that's just part of the story. RIM is screwed. RIM's current lineup of phones is subpar, to say the least. Worse, basically none of the current models will get the marginally newer and better BlackBerry OS 7.0 update. Yet, RIM says there are going to be "delays in new product introductions into the very late part of August." Ugh. Just look what is coming up next, supposedly: Stuff like the BlackBerry Bold 9900. Sure, it'll run BlackBerry OS 7 and might have a touchscreen! But it's also the same handset RIM has been pumping out for the last five years. RIM's jump into the tablet market has been pretty floppy. The PlayBook is impressive under the hood and we liked it, at first. But the lack of basic features like email—something BlackBerry is very known for!—and a basically deserted app store makes it non-buyable. For basically anyone. BlackBerry App World debuted in 2009 and had about 26,000 applications as of April 2011. Android had over 200,000 apps and iOS was pushing 350,000. More importantly, the number of quality apps? A barren wasteland. It's a bad sign when a developer who wants to code for your platform, throws up his hands in exasperation and says "screw it." It's even worse when that letter is posted on the Internet, goes viral and many nod in agreement. RIM's latest quarterly earnings were lower than expected. Terribly so. The expectation for next quarter has been cut 20 percent and serious layoffs loom. Hope you weren't planning on using your RIM stock to fund your retirement. RIM still has two CEOs, neither of which is a bold, innovative leader, even if Mike Lazaridis is an engineering genius. The pair spent a large portion of RIM's recent earnings conference call justifying why this co-leadership is a good thing. How about they just prove it with awesome phones and tons of happy users? A survey from last year suggested more than half of current BlackBerry owners were going to switch to Android or iOS. Enough said. This is death. RIM has a stronghold in the corporate world, but its grip is loosening. In the past, everyone from the CEO to the office manager had a BlackBerry on their hip. Slowly but surely, those BlackBerry handsets are being replaced with iPhones and Droids. Even the iPad is gaining ground. Apple's Tim Cook said recently that "more than 80 percent" of Fortune 100 companies are testing out the iPad. RIM's biggest advantage was its push email and BlackBerry Messenger service. Now just about every smartphone platform has push email (in some form) and Apple's new iMessage is gunning for BBM. BlackBerry OS 7 is already behind, and it's not even out yet. Just look at the voice control and navigation built into Android. Co-CEO Mike Lazardis tried to put a positive spin on the company's "transitional" period when he said, "RIM has taken a unique path, and why we do things might not be obvious from the outside." Someone needs to tell big Mike that it's time to do away with this smokescreen and start releasing quality handsets ASAP. If it doesn't, RIM is going to end up like Palm.